Valentine’s Day is the perfect day to give a sweet treat to the one you love – which is why we’re letting you know that we love YOU with this very special offer. If you’re looking to spoil that special someone, or treat yourself, we have plenty of exciting options to choose from. We have so many muffins that quite honestly, you’re going to be spoiled for choice! The day calls for something indulgent, so perhaps something like Double Chocolate or Chocolate Caramel may be calling your name. Our Muffin Menu also includes all the traditional favourites that you know and love, as well as gluten free, vegan and lower carb options for anyone with special dietary requirements. Everyone deserves to share in the muffin love! Please note that we are expecting this to be an incredibly busy day for Muffin Break, so we might not have your favourite flavour waiting for you. But you know what they say about new love… it’s so exciting. Why not try something different? WHAT’S THE STORY BEHIND VALENTINE’S DAY? Valentine’s Day actually has a whole lot of mystery surrounding it. It’s always been associated with love, but the history books are a little bit murky when it comes to the actual origins. Some say that Saint Valentine was a martyred priest who continued to marry young lovers, even when the Emperor outlawed it. According to him, soldiers were better when they didn’t have wives to worry about, but Valentine allowed them to marry anyway. He was apparently then put to death when he was found out! Other stories tell of the pagan fertility festival, Lupercalia, which involved Roman gods and names being drawn out of an urn to decide which men and women would partner up. It was outlawed by Christians many years ago, but then mysteriously resurfaced around the same time of year, and so many believe that it was appropriated in an attempt to make it seem more Christian! No matter the origins, it’s a fun holiday to celebrate, and it’s especially popular now. Who doesn’t want to celebrate the one they love, or the people they care about? This is one sweet deal you don’t want to miss! 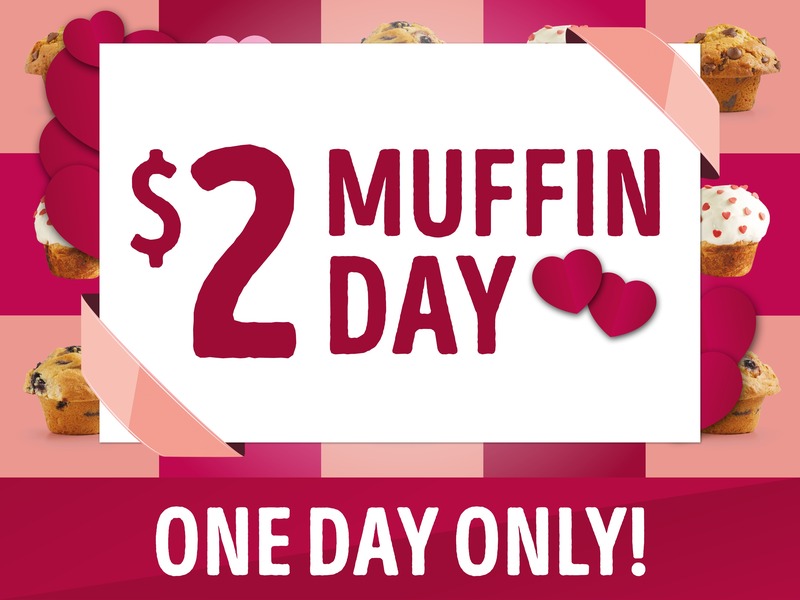 Find your local Muffin Break now to get your $2 Muffin! Limit 4 muffins per customer. Excludes Redfern Station and Entertainment Quarter. Not valid with any other offer. Offers valid 14 February 2019 only.